“Unless someone like YOU cares a whole awful lot, nothing is going to get better…it’s not.” These wise words from Dr. Seuss resonated with staff during the inaugural ‘Champions for Patient Safety’ meeting held on October 17. Drs. 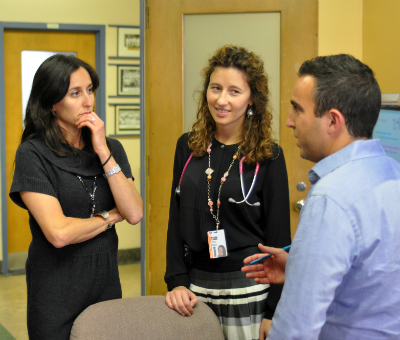 Sasha Dubrovsky, Nadine Korah and Samara Zavalkoff teamed up to head the new interest group in an attempt to improve patient safety around the hospital. 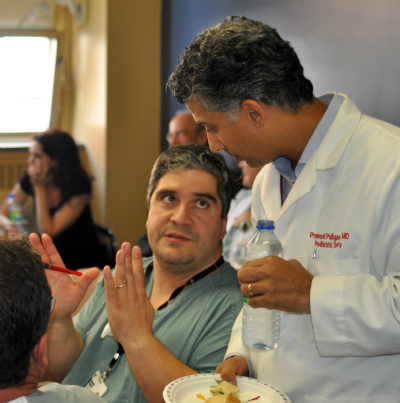 The conference room was packed with medical and administrative staff members from almost every department in the hospital. Instead of a “creative discussion,” the group launched into a “creative destruction” by recognizing what elements of our current system are dysfunctional and then brainstorming on ways we can eliminate them in an innovative way. “Our goal is to create a just and safe culture in a family-centered hospital,” says Dr. Dubrovsky. “And, we plan to do this by promoting awareness, educating our staff and families and fostering collaboration between all departments.” The group continues to meet once a month and all staff members are welcome to join. For more information, contact Sylvie Sahyoun at sylvie.sahyoun@muhc.mcgill.ca. Above: Drs. Zavalkoff (left), Korah (middle) and Dubrovsky (right) debrief after their first ‘Champions for Patient Safety’ meeting. 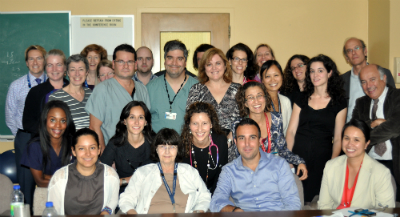 Above: A multi-disciplinary group gathered for the first ‘Champions for Patient Safety’ meeting on October 17.